First, thank you all so much for the kind comments on Sweet Nothing! Kathy was concerned that one needs courage to knit with wire and beads. Not at all! The wire I used is lightweight. As long as you don't pull hard on it and don't try to keep a tight tension, your hands will survive quite nicely. Try it! It's fun! Susan asked if we are twins separated at birth. Yes. Yes, I do believe we are! Now for my question! I have put aside Peacock Feathers for the moment in solidarity with my twin Susan, who, at last report, has not received her yarn. 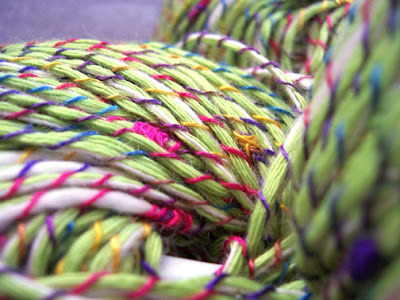 Of course, while I'm waiting for Susan's yarn, I'll need to knit something summery. (Hey! Quit laughing! It's a perfectly reasonable story!) I think I've decided on Campanula, but not on the color. Here's the problem. I lerve this pattern, but I'm not a very frilly person. Jewelry is about all I do to pay homage to my girlieness. I have a sample of a great copper color and want to use that, but I think it would look best in the cream, which might look too frilly for me. I'm not sure that I would wear it in cream. Then there's the dark purple.... What do you all think? Is the copper too out of character with the pattern? Here are the choices all lined up next to the pattern picture. Another possibility is CeCe by Bonne Marie Burns in peach (with 3/4 length sleeves). I'm not that much of a peach person, though. The last possibility is Sitcom Chic (another pattern by the amazingly talented Bonne Marie), in this strange green yarn that I love. It's almost screaming yellow. Perfect! What to do?! Limited knitting time but so many possibilities. Of course, two of these (Sitcom Chic, CeCe) I could knit from stash. You know what that means, don't you? I'll have to knit Campanula! Oooh. I like your "strange green yarn," too! And I'm not a peach person, either, but that shade looks yummy. Like ice cream! I think the copper would look great in that pattern- whatever floats your boat. It looks like you're more attracted to unconventional color choices, go with it. That makes me related, as I'm an honorary Rainey. I vote for purple. But you should know this about me -- I automatically vote for purple, regardless. Oh. My. Gosh. I lovelovelove "Campanula" - what an absolutely amazing pattern! Seriously, I'm totally stunned over here, this must be the most beautiful design I've seen for long - and I so can't wait to see your progress pics! As for the color choices - hmmm, a toughie - but I'd go for the copper, this is such a warm and unique color, perfect for this pattern I'd say! Well, as much as I like the dark purple, I'm not sure that the lace pattern will be visible, after all your hard work. If don't think you'll wear cream (which is my personal favorite!) then I wouldn't waste the effort. Not keen on the green for this pattern ... guess that leaves either the peach or the copper! I would go for copper or peach -- but those are MY colors! I heard from The Knitter and my Peacock yarn may arrive by tomorrow or Thursday! Woo Hoo! I am in the perfect place, too: I have a take-along project and my silk top is 99% done. I really love the necklace -- why can't Surly make her own? Go for the copper! I think it would be an excellent choice. I can just see it ... with a largish medallion necklace hung from a brown leather cord. Oooo yeah! 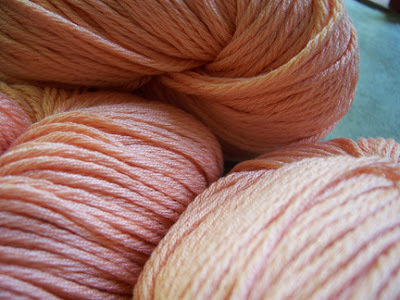 OK - copper for Campanula would be beautiful - I thought that was the prettiest pattern in Knitters!! I've knit Sitcom Chic in the Eyelet Cardi version (just lighter weight) and love it ... I made mine in Classic Elite Premiere (cotton/tencel)and wear it over a t - shirt or tank all spring/summer evenings - a great sweater and I would love to see that wild green yarn knit up - SO - if I had my way you would knit both of those!! I think the copper would be drop dead gorgeous, and I hope you do it in that! Of course, it helps that I *love* copper. :-) I've been trying to decide on a color for this myself. I agree with everyone here - copper would be lovely! And I'm not a frilly girly type, myself. Looks like a beautiful pattern, too. I think the copper would look great! Trust your instincts; you definitely have an eye for color and design. Choose what you love, and what you will wear the most! Thanks for the eye candy, Rosemary! I can't make one more decision right now, not for me or anyone else...feeling totally overwhelmed...but I really enjoyed seeing all that "about to start a project" excitement through someone else's eyes. Thank you! I totally vote for Campanula in the copper! Gorgeous, dahling! Simply gorgeous!